Welcome to my SCAR 17s review! I have owned my SCAR now for almost 5 months. during that time I have put around 400 rounds through it and done a number of the modifications to it. I have in my area a very good group of FN fans who I have been able to pull knowledge from and make certain decisions about how to mod it. I will be covering the different mods that I have encountered, their ups and downs, and the weapons system as I currently use it. I began hunting for a .308 tactical assault rifle back in the fall of 2012. There were a few different choices to choose from and different price points for each. The amount of reviews and lovers of the scar 17s eventually won me over. I chose the .308 caliber as it is also my hunting round and could easily buy in bulk for it at relatively low costs. I am familiar with the ballistics and it trims down on the types of reloading supplies I need. 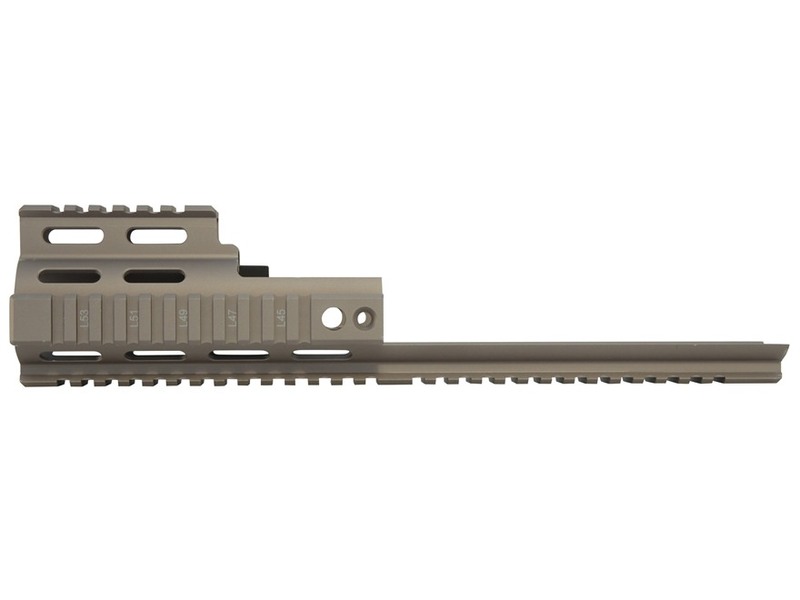 Out of the box the scar comes with 1 magazine, flip up iron sights, adjustable stock, adjustable cheek weld, folding stock w/ folded retention(wont flop around, also will shoot while folded unlike ARs), Gas selector for regular or suppression shooting, ambidextrous charging handle, safety selector, and mag release. Bolt release on left side of gun like AR and casing ejection on right side. Top monolithic rail, and forward rails on both sides and bottom. Comes with great muzzle break which is removable to easily put on your favorite suppression system or other breaks and hiders. Naked the SCAR 17 weighs in just under 8lbs out of the box unloaded. The Iron Sights are great and can easily be used as your main sights. They are adjustable for windage and elevation easily and flip out of the way for storage. They also cowitness with my EOTech well though the reticle on the EOtech when on a brighter setting will cover the front sight. I use them primarily as backups but remember to keep them sighted in and train with them so you are at least capable enough to run them should your optic choice fail on you. Out of the box the kick is extremely minimal for a .308. This is due in part to the factory muzzle break. There are however some tradeoffs. If shooting this indoors at a range with the factory muzzle break, be prepared to make your neighbors very angry. The concussion is massive to the sides of the shooter and people standing directly next to you will feel it. Ear protection is definitely a must as the concussion is very loud. Many of my friends were scared to shoot it due to the "bark" this gun gave off( I have some short friends & shooting companions). But as the saying goes its bark is worse than its bite in relation to sound vs kick. The factory trigger doesn't have a whole lot of creep but it is heavy. Its enough for me to want to get this modded and I have already priced this out. Ill comment more on this later when I talk about the Timney trigger mod. The factory trigger weight is different depending on each individual SCAR 17 says my gunsmith but none come out light enough for my taste. Accuracy is good enough for me. I am not an incredible shooter to begin with but I can punch my target at the 100 yard 1-2" moa on a bench. good enough for my hunting practices and also good enough to put some better glass on and push out further. I have heard that the SCAR 17s will beat up your cheap optics... no experience with this so I can't comment. My EOTech setup keep zero like a boss so far. Factory grip is fine but since I can swap out my grip... I will. That's my personality. I am going to be putting an Ergogrip on it most likely in black. 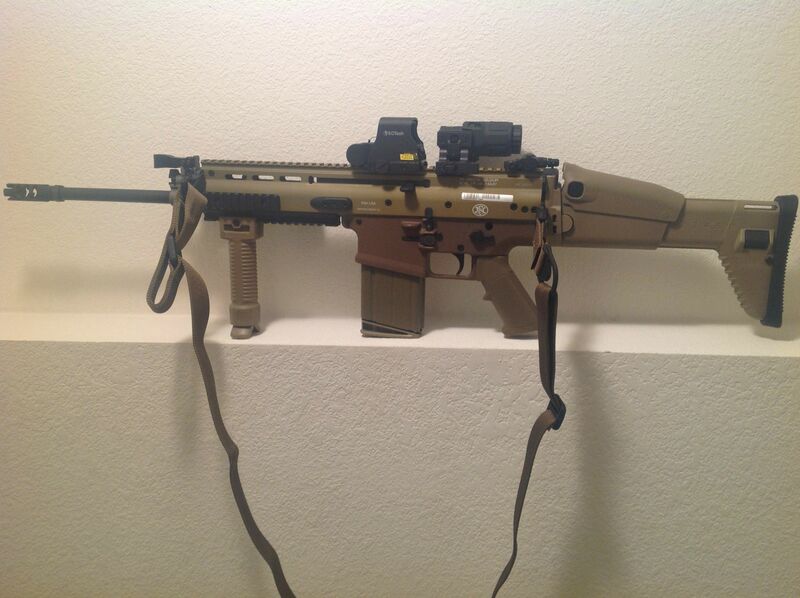 The coloration of the FN FDE color varies a ton. Mine is much lighter an FDE color than others I know. Thankfully it matches kind of close to my FiveseveN pistol but it looks extremely light compared to the FNX-45 Tactical I'll be picking up in a few weeks from layaway. Purchased this after reading that the EOTech optic I purchased would regularly skin my knuckle. They were right but the Tango Down mod didn't change this. The Tango Down might work great with another setup but I love my EOTech and I didn't feel I got my monies worth out of this mod($72.53 after shipping). The tango down has a slight cant downwards to help clear the mounting of optics on the top monolithic rail. Might just be my chubby fingers but I still will catch my knuckle on the EOTech. I run it where the charging handle is on the same side as the bolt release. With Colorado gun laws changing the way they have I was set on having a larger store of magazines in case of breakage, wear, and for tactical training. The SCAR 17 factory magazines, as you may know if you own this gun, have not been easy or cheap to acquire. I purchased 3 extra magazines at the time of my original gun purchase at $50 per. Prices have varied on these up to $175-200 at one point and down to less than $50 now. This was due to early 2013 events and politics but the magazines have remained relatively rare just the same. Magpul launched their Boulder Airlift program and with that I made up my mind to purchase the Handle SCAR-25 Receiver. 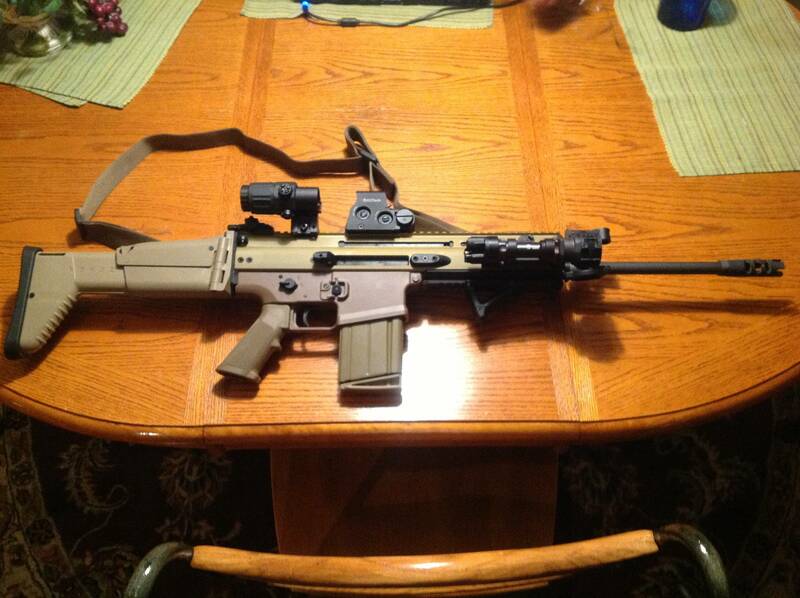 Since the upper on the SCAR 17 is the serialized part, there was no need for another background check or anything. Installation of the receiver should be done by a gunsmith or Handl will not warranty the product. The feedback I got from the gunsmith was that the holes were very tight on the receiver when switching over the trigger assembly. A nice part about the receiver is that you can use any AR15 aftermarket grip, unlike the original receiver. Also the Handl is designed to accept AR-10, SR25 magazines and the X-25 drum magazine. I purchased some pmags from Magpul ($20 each!) which are great and an X-25 drum just for the fun of it. After getting it back from the gunsmith, neither worked well... as in neither would actually seat in the magazine well properly. The pmags would push up again the bolt and would need some finessing, or a good smack in just the right direction, to get them to stay in. 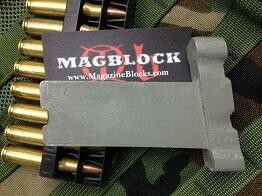 The charging handle would not move fully forward when released either when the pmag was seated. THIS IS WHAT THE RECEIVER WAS DESIGNED FOR! Very frustrating to say the least. The X-25 drum magazine wouldn't even catch when the receiver was separated from the upper. Ultimately this experience is actually what made me write this review so others don't encounter the same issues. I took the receiver as well as the x-25 drum back to the gunsmith to fit everything specifically. He got a good kick out of the fact that even the SR25 magazines wouldn't sit nicely with this mod. Moral of the story, not a cheap or easy mod and has not shown to work well on first experience. I will add to this once I get it back from the gunsmith and put some rounds through it to see if mags feed well or if they get popped out. This was the first foregrip I put on my SCAR. Slid onto the front lower rail easily enough but left no room for a bipod and wasn't my favorite grip in terms of feel and support. I soon switched this out for another foregrip and put this onto my KSG Shotgun which was a perfect match. After not being totally satisfied with the angled forgrip I purchased a mil spec vertical foregrip with internal bipod. The bipod deploys with the push of a button with your thumb and overall felt way more comfortable. It also worked well with the pressure switch for the surefire flashlight I had. This is where I settled and am very happy to stay with this. I chose this to run because I love the EOTech. It's a great holographic and I like the optional choice of magnification unlike an ACOG setup. The main downside is the conflict with the charging handle but I love the EOTech too much to give it up. This setup still gives plenty of room for a night vision setup to be added. with the quick disconnect mount on them It's easy enough to swap in a nice piece of glass for longer range shooting if you're trying to see how far out you can take it. Bought this because of the hunting laws in colorado limiting hunting magazines to 5 rounds tops. this became a void mod for me after I installed my Handl Receiver since you can locate AR10 mags with 5 round capacity. This thing is awesome. If you are a reloader or just concerned about the environment and leaving a trace then this thing is worth it. Yeah the price tag is steep for a brass catcher but it is SO well constructed. It has a quick disconnect mounting system for your rail, quality brass bag and a very nice zipper on the bottom to release your spent brass easily. I own a factory FN brass catcher for my PS90 and this thing will make you realize how lame and awful the construction is on those FN brass catchers. I have not lost a single piece of brass and could easily sell off the brass I have shot to pay this thing off. This cost 177.95 for me after shipping. If your thinking of doing some helicopter hunting this is definitely a must. I did not buy the metal tango down collapsible stock button. I've read that while replacing this will help the tabs to not break on the scar(which I havent actually seen anyone do on any forum) replacing it will transfer the weak point to the actual stocks tab holes which are also the same polymere. I'd rather have the button tabs break than the stock in my honest opinion. I believe there might be some other mods coming out in the future that will address the stocks tab holes being a weak point. for now I'll keep it how I have it. My gunsmith friend will be doing my trigger work for me. The Timney trigger was double the cost of a gunsmith doing trigger work. There are definitely upsides to the Timney trigger like its ease of installation being basically a drop in. However the Handl warranty doesn't exclude the Timney Trigger from needing a gunsmith install for the warranty so there's an extra $50 if you want the warranty. I plan to have my trigger pull reduced to 3.5lbs by a gunsmith. The person I use has done a number of SCAR 17 trigger mods and has a proven track record with them. This mod I would weigh to your personal situation. I love my SCAR 17s a ton! This is such a fun gun with a lighter weight for the .308 and so many included features right out of the box. It's also so easy to add a suppression system and that will be my next adventure after I get the tax stamp I'm currently waiting on back. If you have the money for this gun then this is is fantastic! prices have come back down lately on them since a few months ago (one sold at a local gun show for $7k in February) but on gunbroker they are almost back to normal. I think they are sitting at $3k right now as I type where I picked mine up from gunbroker for $2.7k. I have a hard time leaving anything straight up factory and with the SOCOM use of this gun I am sure we will see more continued development of the mods and accessories market for it. Thanks for reading my first review ever and leave a comment about your experience or questions! bench shooting at the range. Nice write up....though we disagree on LOTS of the mods....I have heard nothing but problems about the Handl not being finished well and jamming with mags all the time. The stock trigger is junk.....I have both a SCAR 16 and 17 and have Geiselle Triggers in both....its THE single best mod that can be made to the firearm. The Shooting Sight Trigger is also excellent. I will update further when I have more time. Enjoy and get some shooting time in. not sure we disagree so much the Handl mod is giving me a headache. im going to stick it out till I just can't do anything else though since I'm this far in the process. The gunsmith I'm using has done a number of other trigger jobs on the scar and I was checking some of his other work and liked it. Don't have anything bad to say about the geiselle because I only heard of it after seeing it on another guys gun here. the cost factor being $325 + shipping on the geiselle is my holding point. for less than 1/2 that the gunsmith seems worth it for me to try first. I fully agree the stock trigger isn't my favorite though. hence why Im looking to get work done on it. Sinder wrote: not sure we disagree so much the Handl mod is giving me a headache. im going to stick it out till I just can't do anything else though since I'm this far in the process. The gunsmith I'm using has done a number of other trigger jobs on the scar and I was checking some of his other work and liked it. Don't have anything bad to say about the geiselle because I only heard of it after seeing it on another guys gun here. the cost factor being $325 + shipping on the geiselle is my holding point. for less than 1/2 that the gunsmith seems worth it for me to try first. I fully agree the stock trigger isn't my favorite though. hence why Im looking to get work done on it. If you don't want to pay that you have the option of getting a Timney. And alternatively, Shooting Sight has a SCAR trigger that has received excellent reviews thus far. Run the Geisseles here and there is no comparison between the Super SCAR and the stock trigger. However, plan on investing in a Shooting Sight SCAR trigger soon to test as well. The Shooting sight is $250 I believe, however Timney has raised the price on their SCAR trigger to $309 so it is roughly the same cost as a Geiselle at the present time. When I get time later today...I will finish out my comments on SCAR set up. 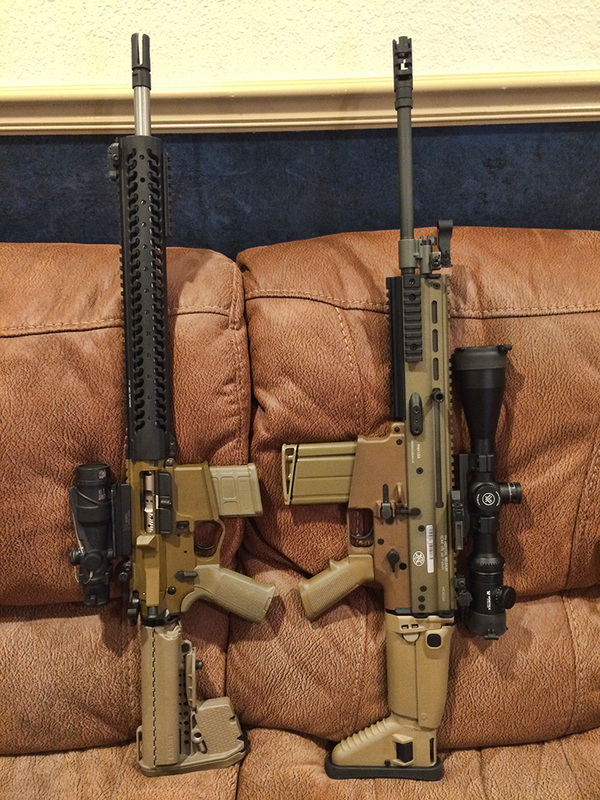 I have an FDE SCAR 16 and a Black SCAR 17. If you're still watching your thread, now that you've had this rifle for better than a year and a half, how has it been to live with? I am no stranger to .308 (2 bolt rifles, a custom AR-10 and a tricked out M1A), but I just bought my first FN product - a SCAR 17s in FDE, so it's good for me to pick the brains of people who have owned one for a while. I just took delivery of it last night, so I haven't had a chance to shoot it yet; but I have played around with it some last night, to check the controls, etc. I have to say that my main (and so far, only) complaint about this rifle has to do with (A) the amount of force required to depress the stock release button far enough to allow the stock to be folded, and (B) the fact that the tabs on that button don't allow it to be simply snapped back into the unfolded position.... requiring exactly the same amount of force to extend the stock. The lip under which those tabs must pass is ramped to facilitate snapping the stock into the extended position, but the tabs themselves are too tall to pass under the ramp, extending above where the ramp begins. Perhaps if I weren't an old poop with with the beginning of arthritis in his hands, this would be a non-issue. But I find that it takes a gorilla-grip +1 to actuate that dumb button. Good to go, with no more money spent on expensive glass. A friend of mine who also has a recently acquired 17s warned me against the Handl lower you bought, and pointed me to one made by Stryker Enterprises. He said he had a Stryker on order. Unfortunately, when I looked at the site, they only offered a 16s lower, and a lower for the 17s was not listed. If anyone can point me to some other manufacturer, whose lower will not add significant weight to the gun and which will accept SR25/Pmag magazines, I'd be interested. Honestly, I could live with this rifle as is if I had to. It reminds me of nothing so much as a modernized FAL, and that's not a bad thing. I've already purchased 3 replacement FN mags from Brownells ($37.15 each at member pricing with "gunsmith" membership). So, unless I was in the s..... uh.... stuff, I'm good to go. I'm betting that it would be possible to mod an existing metric FAL mag to work in the SCAR without spending too much money......so I'll be investigating that possibility. If that isn't feasible, I'm OK with that. Anyway, I'd be interested in hearing what your long-term experience has been like.